When are you buying the iPhone 5? 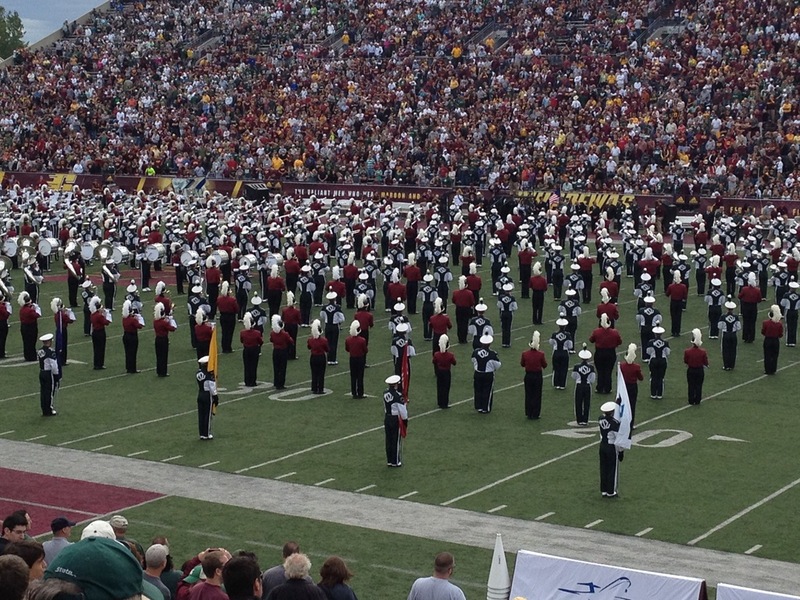 Week 2: MSU 41, CMU 7. Spartans now ranked #9 according to AP. Next up: Notre Dame. Big game Saturday night at Spartan Stadium. Can the Spartan’s make it 16 in a row at home? One note of interest was that this was MSU’s first appearance at Central. 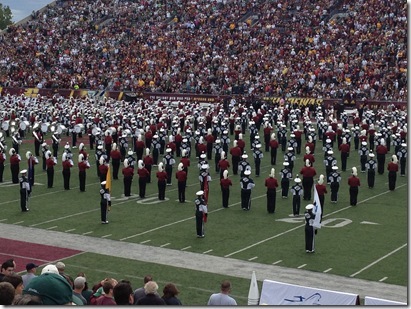 The game had a record attendance of more than 35,000 and both marching bands joined in at the end of halftime. Very cool. Both the LIons and Wolverines were lucky to pull out victories. Let’s see what happens when they play quality teams. And yes, it has been a while since Spartan’s had bragging rights. My yoga teacher today repeated a well know proverb, “How you do anything is how you do everything.” One of the best. Beauty Buzz is less than a month away, hard to believe. It’s going to be a fabulous program and a huge fundraiser for the American Cancer Society. It is October 7, 4-6PM at the Motor City Casino Hotel Sound Board. Visit for more info. Over Labor Day, Carter came in to visit. 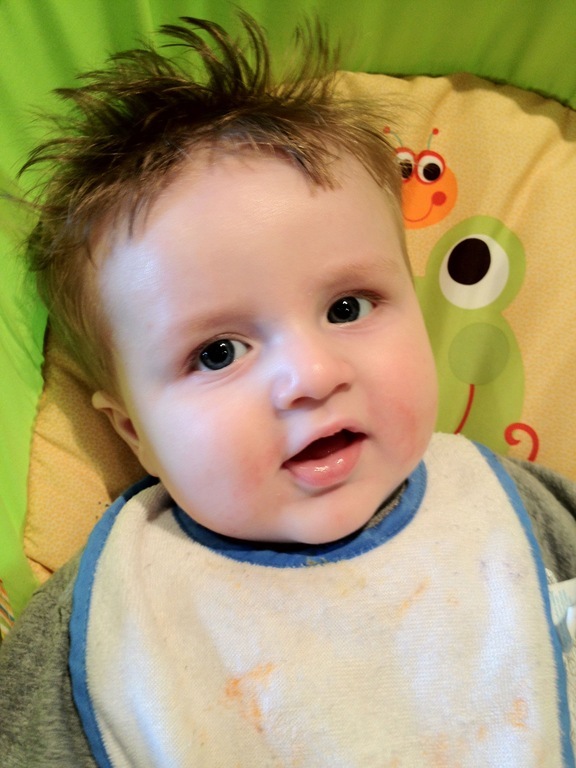 Now 7 months old and already eating real foods and standing up. It is very cool watching the growing up process all over again. All of a sudden, 18 years from birth to college doesn’t sound like a long time. Mitch Albom has yet another book out, this one about time, The Time Keeper. I have not read the book but it starts out about the person who actually decided to come up with a way of keeping track of time. This lead to a day, week, month and year concept. Albom discusses what it would be like if we had no calendars, no watches and no time to pay attention to. What I have always found fascinating about time is that everyone complains they never have enough of it. But when it comes to finding time to do things they really want to do like go on vacation, people always find the time for that. One subject that Albom recently wrote about in the Sunday Free Press is how time eludes us quickly and there is a reason why we don’t live forever. One comment he made that resonates is why do we want more time? So many people are in a routine and they don’t want to step outside that routine even for important events. Time marches on, it’s what we do with it that counts. Moroccanoil Body hits salons and spas this month. Premium retail line, premium pricing and premium packaging. Retail prices range from $10 to $52. It will be interesting to see which, if any, argon oil hair care companies follow suit. ULTA announces record earnings and store revenue once again driving the stock to over $100 a share. Joico is updating its entire line with new packaging for 2013. The current packaging never took off and word is that the new packaging will feature brighter and bolder colors. Hmm, wonder if ULTA buyers had a say in this? Jan Arnold is the mastermind behind Shellac and the co-founder of CND. Jan is hosting perhaps her last really big Shellac class in Detroit October 8. The event has sold out but we have added another 50 tickets due to demand. If you are into gel color, then this class is a must. You will be amazed at what you can do with Shellac and a few nail art items to create amazing nails. Wednesday Apple will unveil the iPhone 5. This will be the most incredible smart phone of all, at least for the next few months. Larger screen, 4LTE technology, perhaps NFC technology (to scan credit cards without taking them out of your purse or wallet), navigation that talks while you drive, online music streaming (good-bye Pandora) and a whole bunch of more stuff that we didn’t know we needed. The iPad Mini will be even more fun. Carter is so cute. Love the hair! I can see that Carter looks a lot like his Daddy. Too Cute! Mr. Carter, you are adorable. I can see the Gaynor in him. What a ‘doll’. Can’t believe he is so big already, time does fly whether you keep track of it or not. Bet you both had a wonderful time with him! !